The brand spanking new 2019 iRockers! It’s pretty much Christmas all over again this time of year. There’s been a high level of anticipation over here at Supboardguide waiting for these new boards. So, what do we think? There are some changes from last year. Some obvious aesthetics, some upgrades and a whole new model in the range! It’s all very exciting, and we are stoked with what we’ve discovered so far. So I’m not finding a huge difference in general performance from the 2018 model. Which makes sense given that the shape and materials are identical. However, with the introduction of being able to remove the side fins, there’s room for a slight change in how the board turns and tracks. Choosing to go single fin, you may find that your tracking improves. Generally speaking, single fin setups are great for holding a line in the water, adding to the board’s momentum and glide. 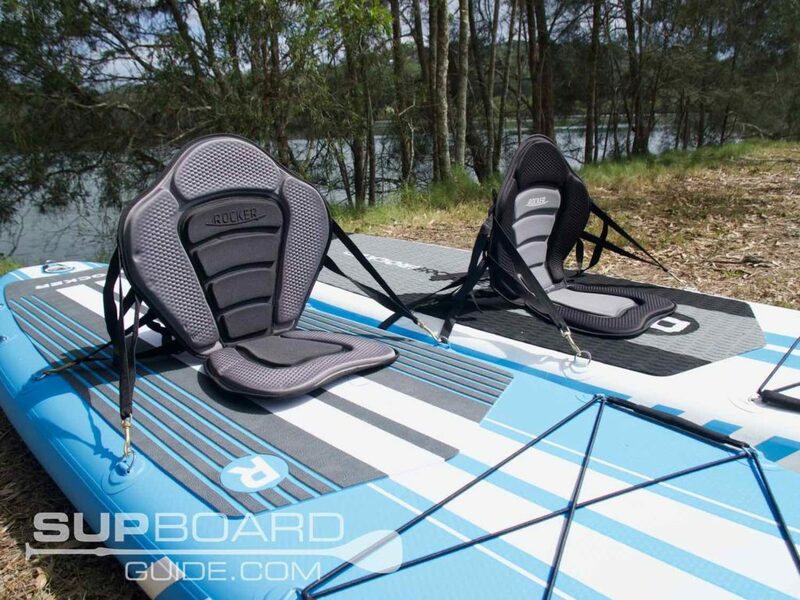 While side fins can provide a little more stability and increased control in turns. There’s also a choice of a lower profile fin which means you can confidently get into shallow waters and stay in control! Now as I’m covering both the 10′ and 11′, I’ll explain the difference between the two. Aside from the obvious weight capacity and length difference, there’s a slight difference in performance. The 11′ cruises and holds its speed a little better than the 10′, but takes a little longer to get going. The 10′ also is a bit easier to turn, especially if you are a smaller rider. For these boards, being all-arounds, it’s best to match the size of the board to the rider. 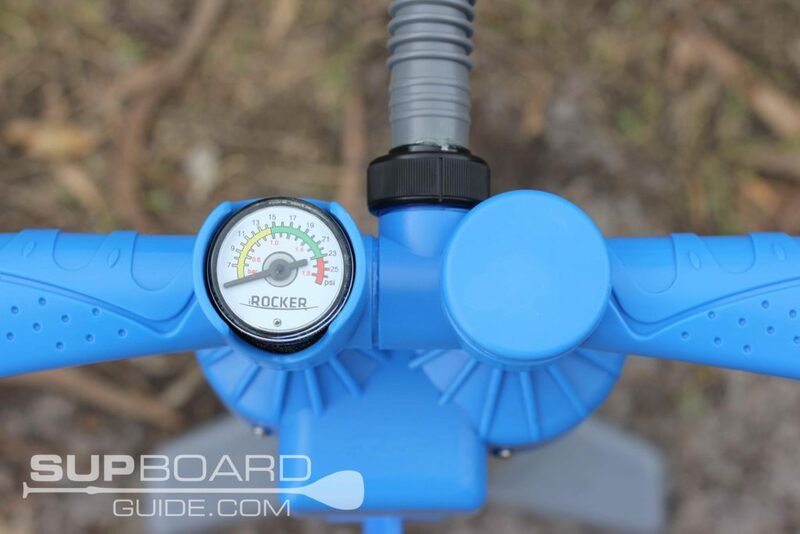 If you are a bigger rider or plan on taking your kids/dog/kitchen sink out on the water, the 11′ will not only hold the weight better, it will be more stable. Whereas, especially if you are a beginner, you’ll enjoy the 10′ better if your weight is closer to its max capacity. 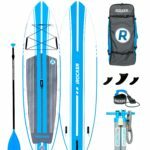 I’ve found the all-arounds to perform best in flatwater conditions to the low end of something more challenging. I wouldn’t recommend them in steep or big surf, nor in heavy rapids. They could definitely handle it as far as materials go, but the buoyancy of being 6″ thick makes them not quite responsive enough. One of the best versatile options they have is being that they are skill friendly. That is, if you are a beginner to intermediate, they are a pleasure to be out on. Hence why they are so popular!! Also, perfect for kids to come out on with the handles up the front but also easy for them to have a go too! As mentioned earlier, the materials in the 2019 range are the same as the 2018 range. 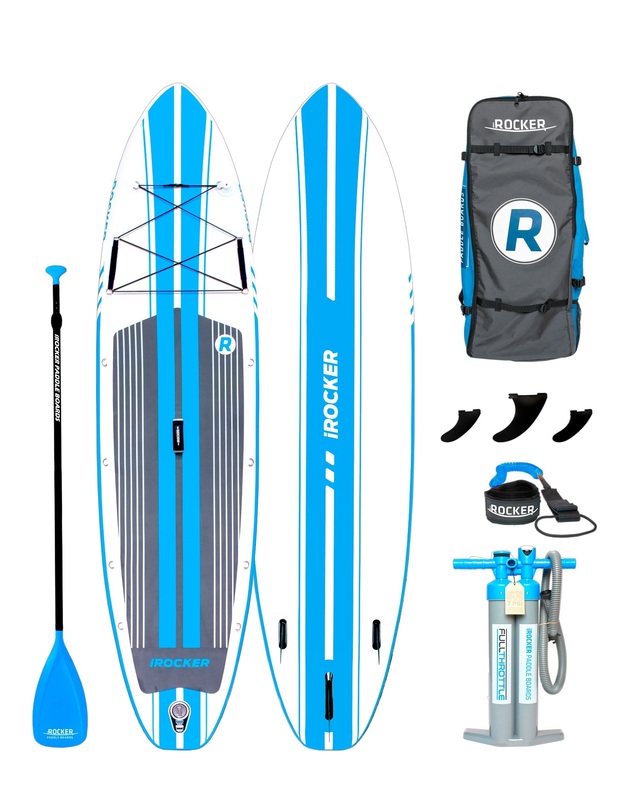 For those not up to date with iRockers, they use a quad-layer PVC to put their boards together. The layers of PVC protect the drop stitch core, which is what gives the boards the feel of being a hardboard. Drop stitching allows layers to be held together but not be put under strain with high pressures of inflation. The PVC is military grade, ensuring a bulletproof board. I have put these boards to the test in multiple scenarios and a year and also 2 years (2017 models) on, they are still as strong as the first day I got them. No seam splits, no punctures despite the odd run-in with oysters/rocks and the deck pad is still thick and in place. The deck pads materials haven’t changed, but its design has slightly. However, I’ll go into that further in the board design part of this review. 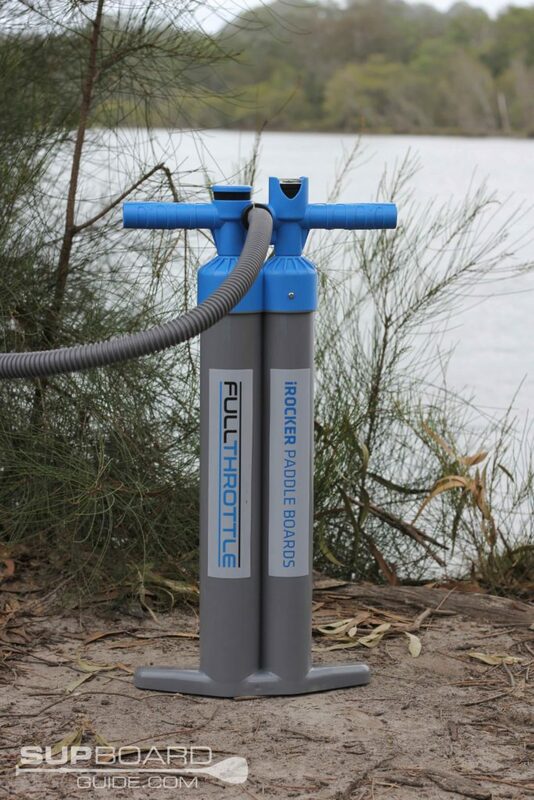 You can have your board pumped in 5-6 mins with the new full throttle, triple action, double chamber pump. It’s fast and efficient! Getting inflated from about 10-15 PSI can be tough work, but with a few actions and double the amount of air going in, you’ll be sighing with relief, not effort. Though if you are regularly out and about, a compressor is probably the first thing I would suggest upgrading. Which lucky for you can be purchased through iRocker also! 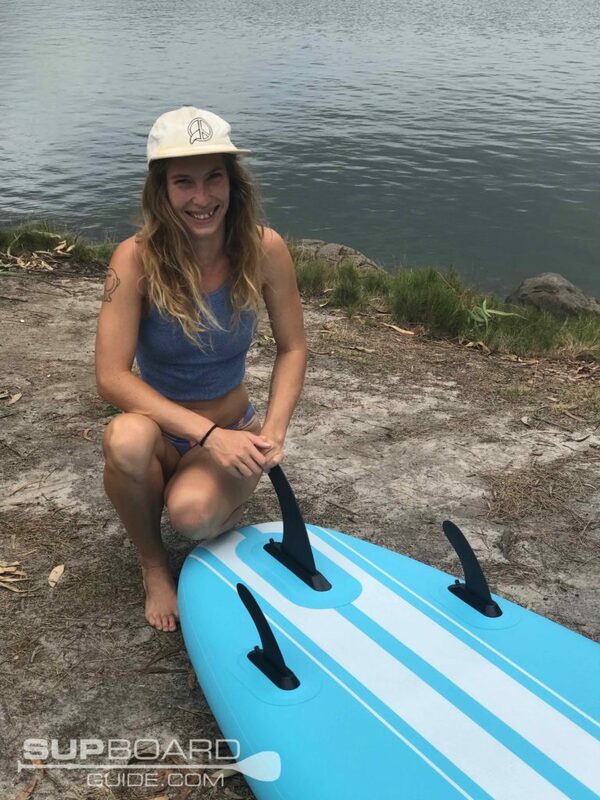 Same deflation tactic as previous years/models, push the pin in and twist, the air will escape, and then you can start rolling your board up once you’ve got a bit of air out. 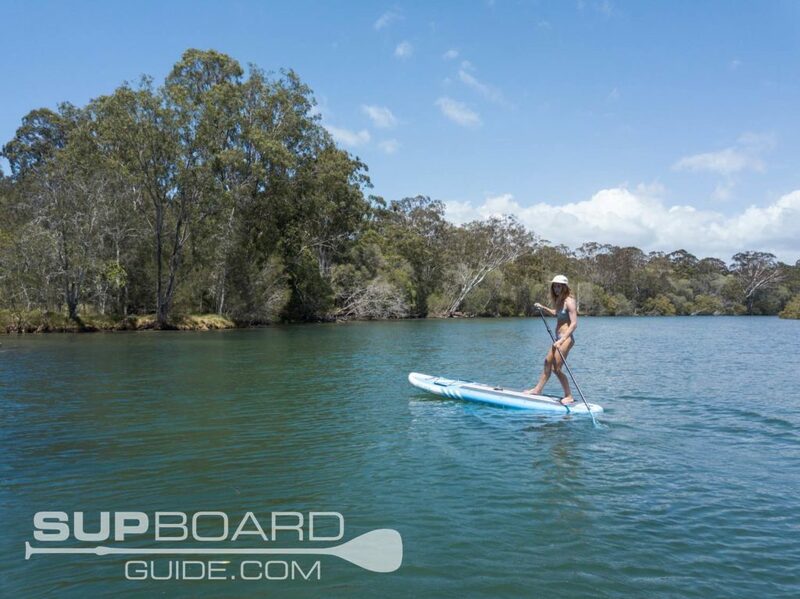 Wrap it, strap it and put it in your bag for the next paddle. An improvement in the deflating apartment is that with the side fins being removable, you’re now able to roll the board up even tighter. In the performance, it was mentioned the side fins are removable now as well as the center fin. The fins share the same materials as previous years, which mine have definitely taken a beating in the past and they are still going strong! 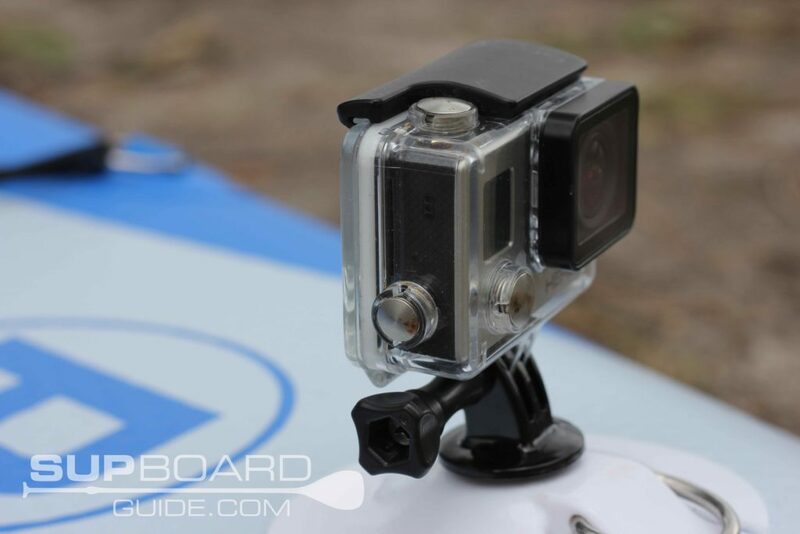 The side fins are made from the same tough plastic as the center fin and snap lock in the same also. 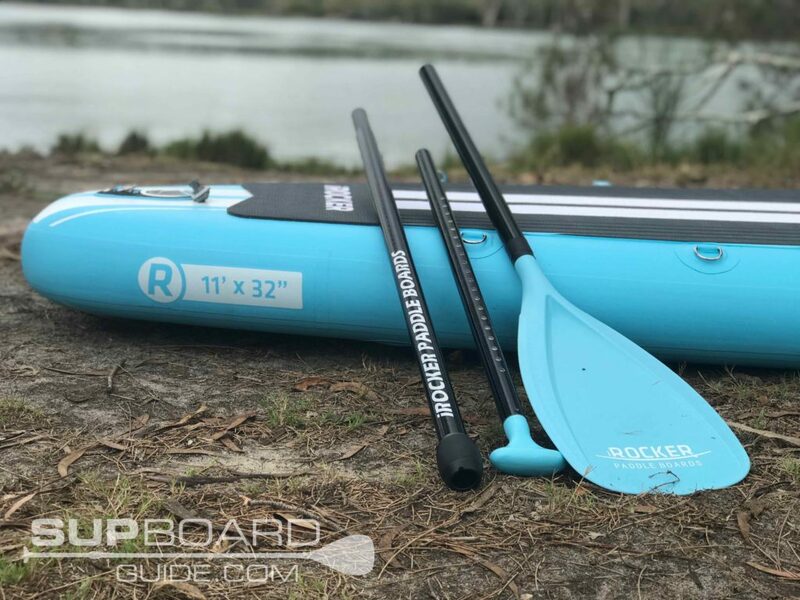 It’s a great system that’s fast and easy to use however these types of fins also aren’t nearly as nice as the Blackfins. I think I’m a little fin-icky (haaaaaa) about my fins as I know the importance they play once you move on from just generic paddling. I would love to see a fin upgrade at some point for iRocker range, including a US fin box to interchange the center fin. 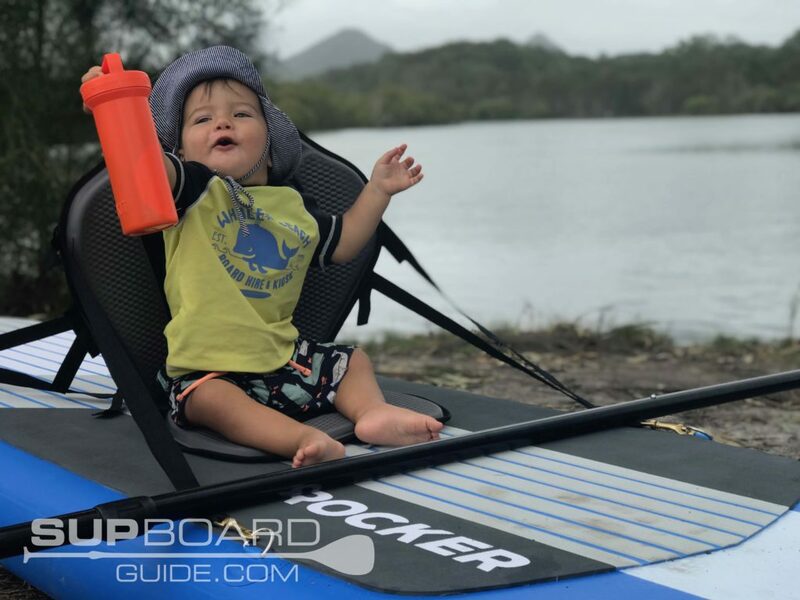 One other improvement is that they are offering a lower profile snap lock fin for the iRocker range which gives you safe access into shallower waters. Here is where we go into the real new treats of 2019! So it’s obvious the aesthetics have changed, the pinstripe all the way down and some color differences. Some of the other changes are a little more sneaky. 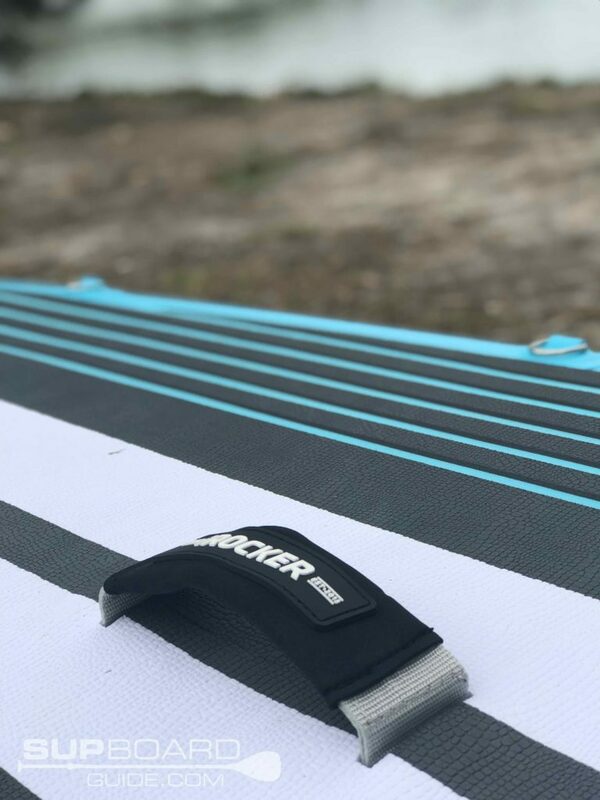 The deck pad is a crocodile texture with color-coded beveled edges on the grooves which adds some extra comfort and grip. Looking down the board, you’ll see there are some extra D-rings! Yipee! You can either purchase some extra bungee and create more storage space on the tail or attach your cooler bag behind you. While the other option (so long as it’s two smaller people and more probably suited for the 11′) is to attach two kayak seats. Now you probably wouldn’t notice unless you had 2018 as well, but the D-rings up the front have been spaced out a bit further, allowing for more storage room. The more space, the more options you have for adventures, especially with the added action mount up the front! If you scroll down to the “Extras” you can take a squiz at what you can purchase for the said mount. This year’s paddle is also the same as last years, but that’s totally fine! Of course, there are better paddles, but that would also require a price increase. So for this price range, it’s definitely a win. 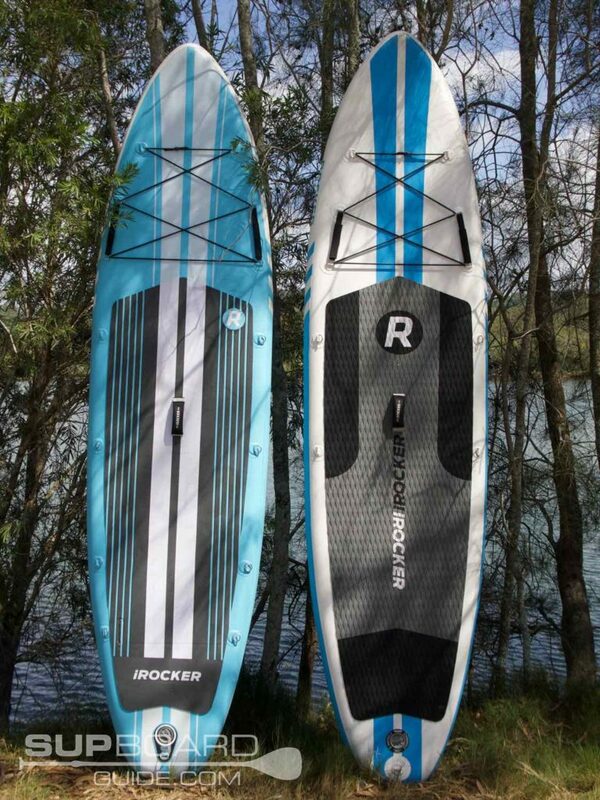 Some other companies offer aluminum paddles which are heavy and tend to flutter, but not iRocker! 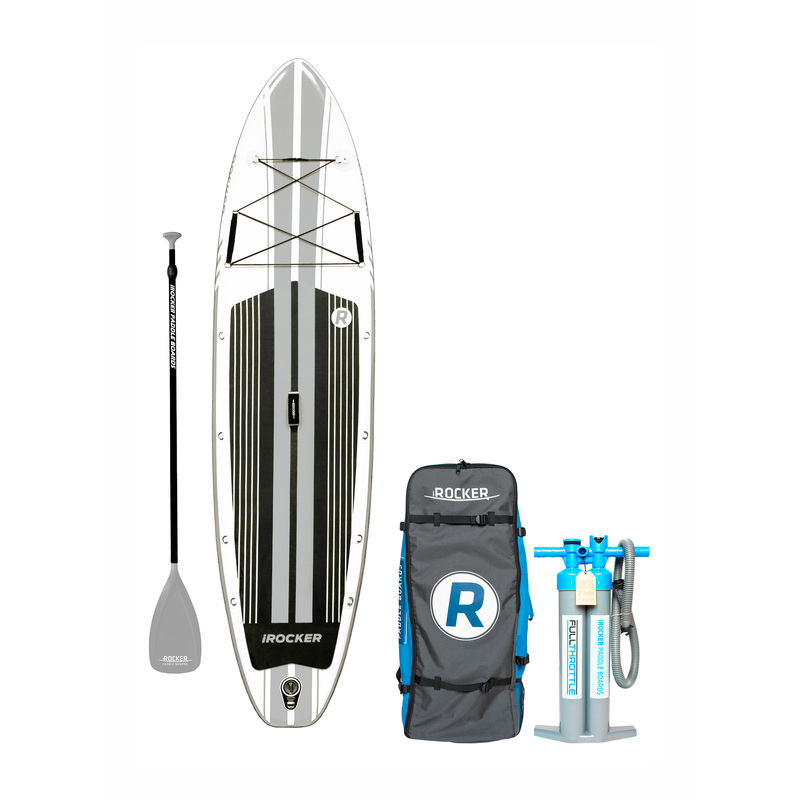 Nope, you get a fiberglass paddle that locks together securely and packs down easily. Following on from that is that your paddles are color-coded! So, that doesn’t help you paddle better but sure does make you look good! Storing it all away is easy with the spacious bag provided. It zips all the way down making it easy to get your board in and out. 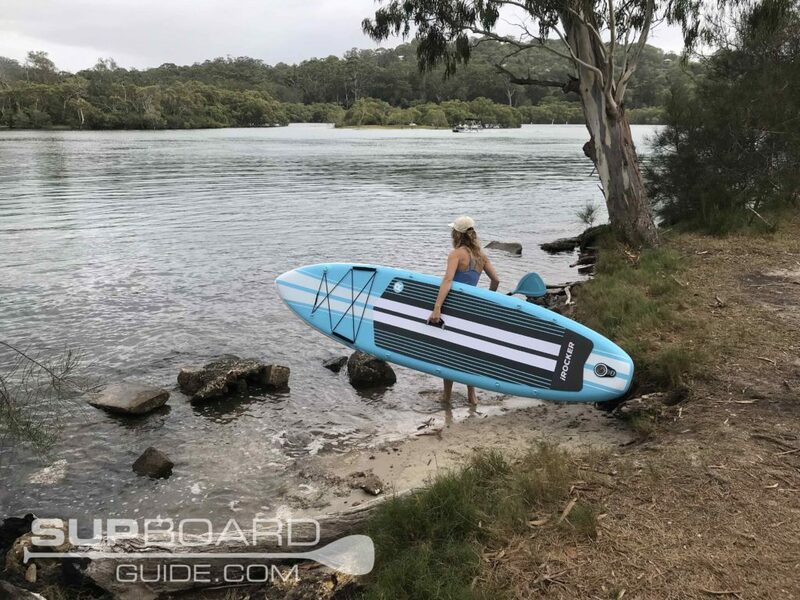 While there is plenty of room inside for your board and all its gear, 2019 sees some new D-rings on the outside to help attach the optional purchase of a kayak seat. 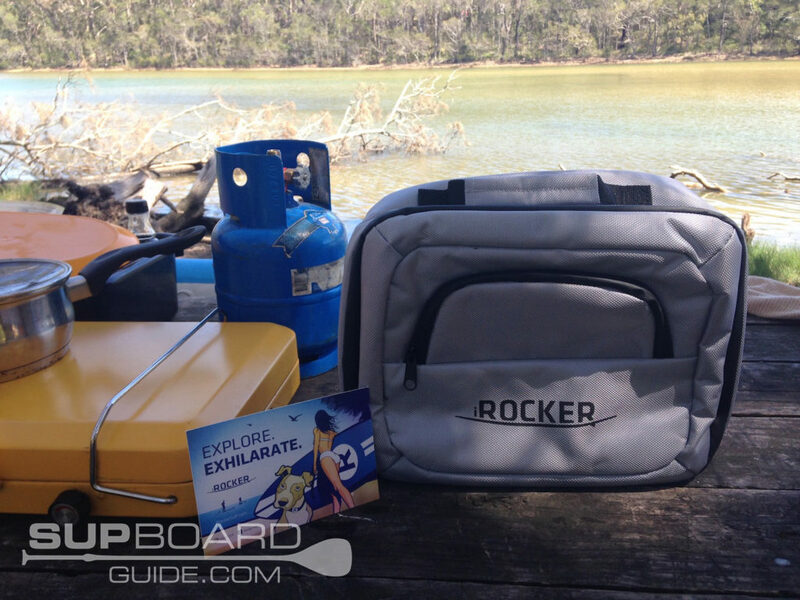 Mid last year iRocker bought out their new double chamber, triple action pump to go with all iRocker purchases. The one that you get with the 2019 range is an upgrade again. Their shiny new full-throttle pump is 25% lighter and reduces pumping efforts by 50%*. I entirely agree it’s a whole lot easier and faster, it’s probably on par with a compressor by the time you’ve hooked the pump up to your car, etc. Again, the leash is the same as in previous years. But there’s no need to change it, so why would you? Beautifully color-coded, with an elegant coil and suave stamping on the cuff. 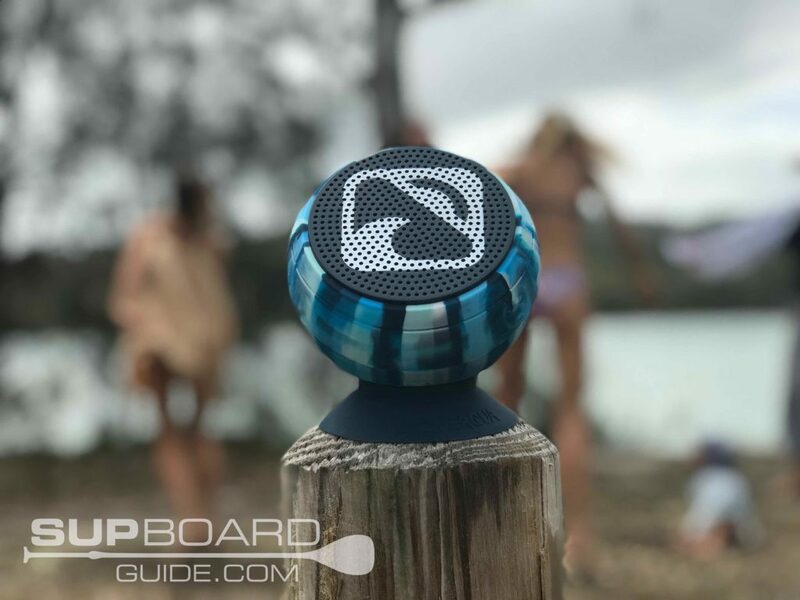 Take it on your board, take it to dinner, either way, you’ll be impressing people. Your little orange safety friend. There to service your needs in the case of sudden disaster, that is, your board getting a puncture. The other part of the kit is the valve tool so you can self-service your inflation valve if it needs it. Suffice to say, I’m yet to ever have needed to use the repair kit. Pump the party with this little ball of wonder. There’s 4GB of space for storing tunes so leave the phone behind and have a stress free paddle with music! Got a call you need to take though? That’s fine, so long as you’re within range you can take calls as the speaker has a mic and even a Caller ID function. Being entirely waterproof and additionally, even floating, there’s no risk if this guy tumbles overboard either. If you are someone who likes to get around to all the places, then the all-around is for you. The differences between the 10′ and 11′ aren’t huge, though if you are a bigger rider or planning on taking extra weight often the 11′ should be your choice. 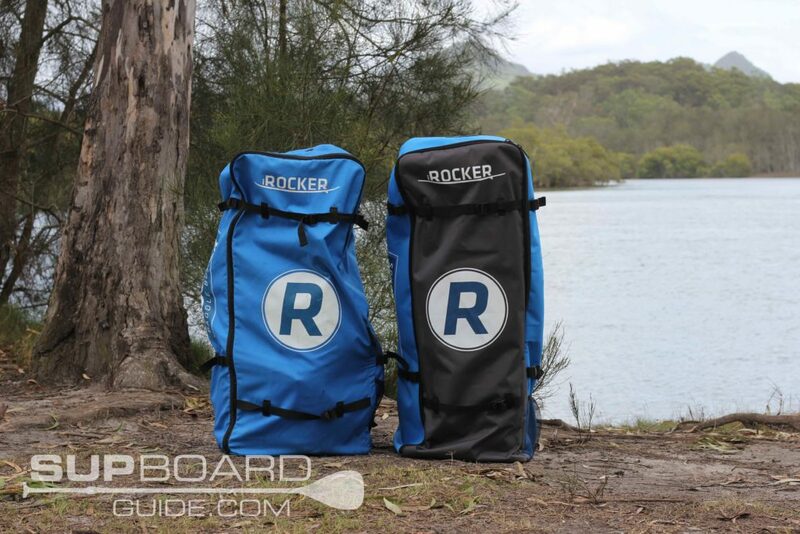 Every year iRocker brings out a better series than the last and this year is no exception. It’s not hard to understand why their popularity has skyrocketed in the last couple of years. 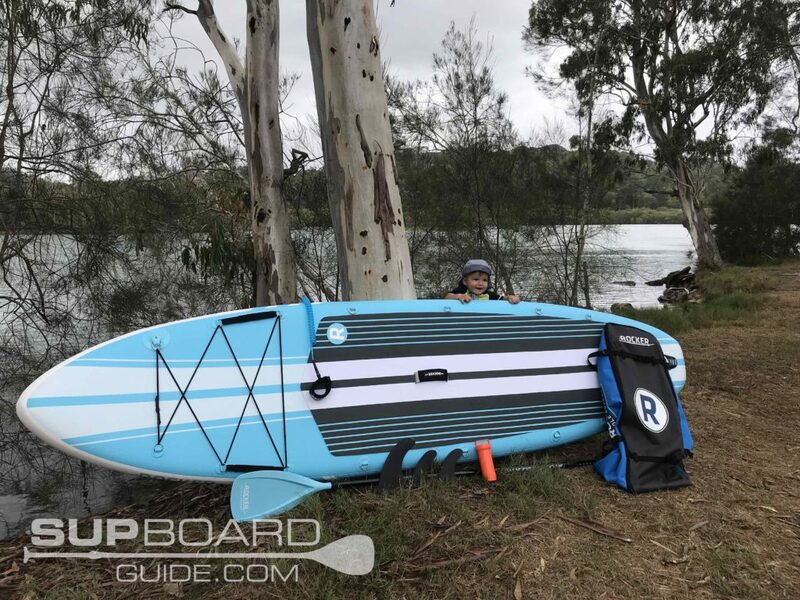 Sporting a 2-year warranty and 30-day return policy, you can buy with confidence even if you don’t entirely trust me that these boards are awesome! 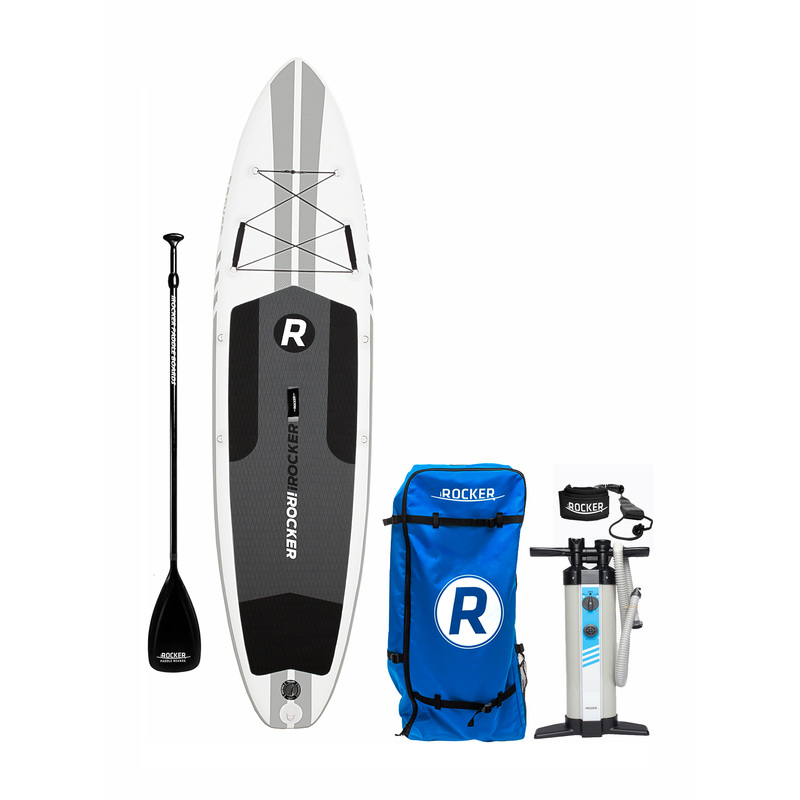 There are other all-arounds out there that are more suited to trickier conditions and they have price tag to go with it such as the ERS Skylake and Red Paddle Co Ride. 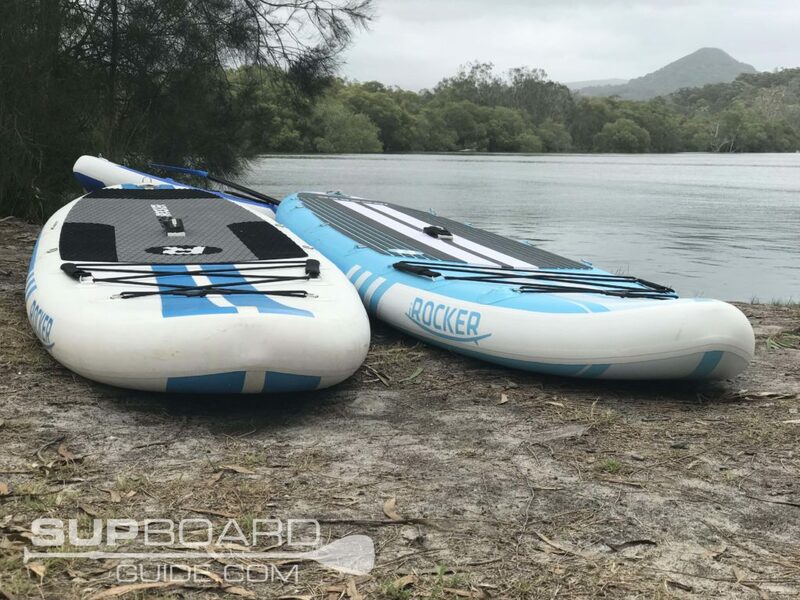 So if you are looking to get super adventurous, I would suggest looking to those, but if you are happy just dipping your toes in smaller waves and some not too dangerous rapids, you can’t beat the value of the all-arounds. Awesome! Been waiting for the new boards. Time to upgrade from my 2017 model. Yeah it is! You’ll absolutely love them if you are upgrading from 2017!